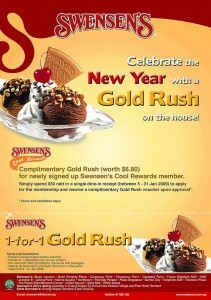 Simply spend $50 nett on a single receipt at Swensen’s today to get the membership and receive a complimentary Gold Rush voucher. Shouldn’t be too difficult if you are going there with your friends or family. Only valid from 5th-31st Jan 2009. *Remember to present the coupon before ordering!